Belvoir Brewery is a Leicestershire brewery, just a stone’s throw from Melton Mowbray – home of pies and cheese fairs. It’s now 20 years old, which isn’t ancient by any measure but certainly means it pre-dates the craft beer revolution. 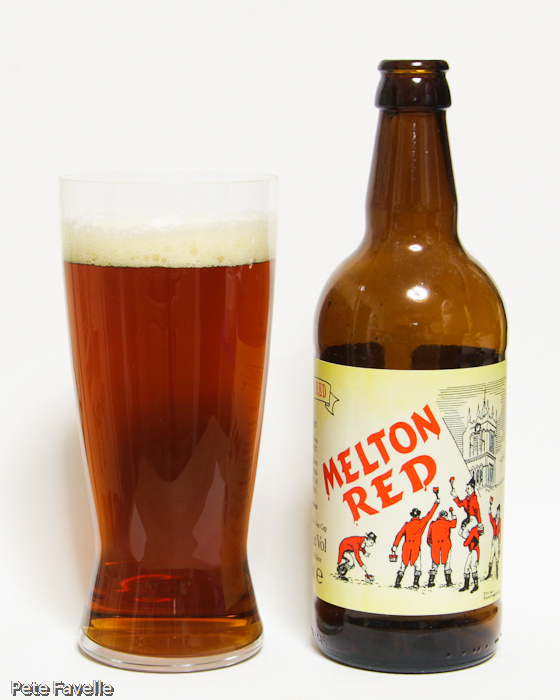 They have a number of beers in their core range – the website lists 8, although curiously leaves out possibly their best known beer, Melton Red – but as is often the way, there’s a lot of duplication. The bulk of the range fall within a 1% ABV spread, many of which look surprisingly similar. 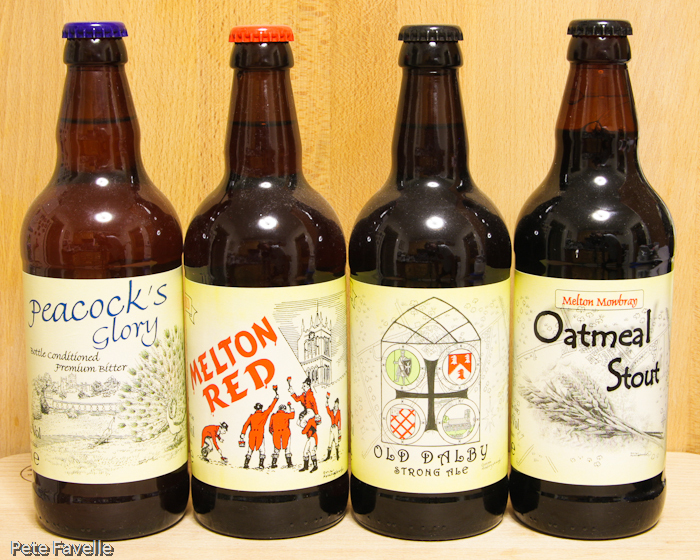 The bottles I picked up are from the top end of the strength range, and are all traditional British ales. Peacock’s Glory is a 4.7% Premium Bitter. It’s a golden ale, fairly flat and with little or no head apparent. The aroma is light and a little sweet, with a touch of perfumed tree blossom and just a hint of spice. In the mouth, more gentle sweetness and a biscuity edge, with just a touch of bitterness at the very end. Unremarkable, but a decent and drinkable bitter. Melton Red is a 4.3% beer named for the local town of Melton Mowbray. 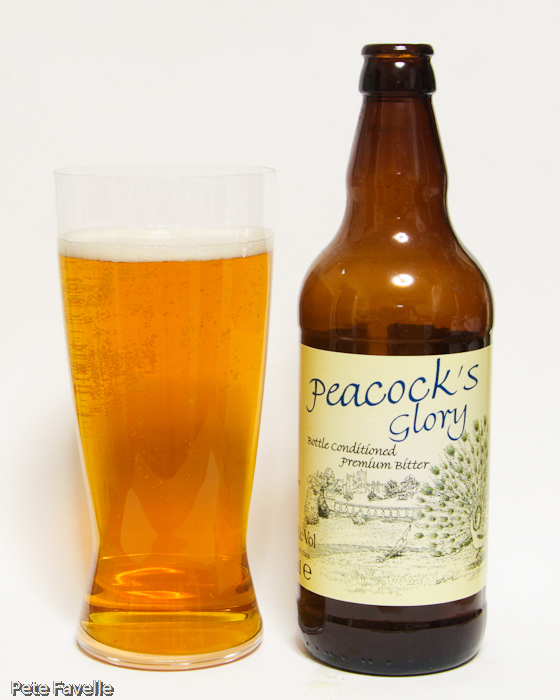 It’s a gloriously rich, amber coloured beer with a soft but more pronounced head. The aroma is sweet, with toffee and dark honey. In the mouth, the toffee persists and is joined by sharp blackcurrants and a nice, robust bitter kick at the end. A classic and very quaffable amber ale. 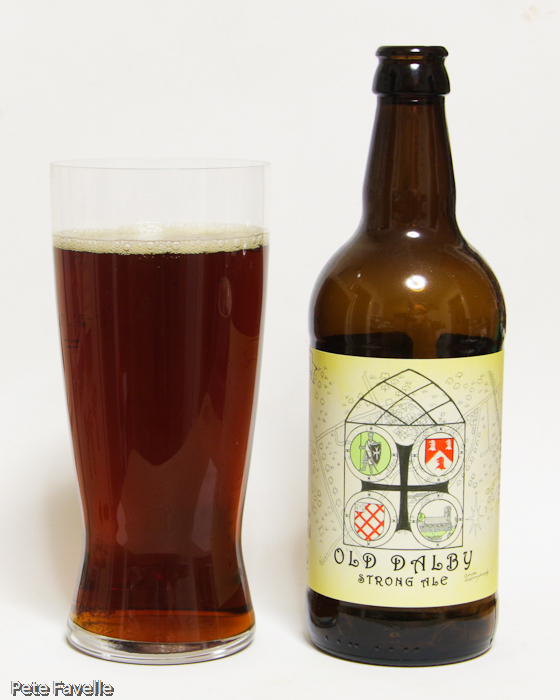 Old Darby Strong Ale is pushing the boundries of “strong”, at a mighty … 5.1% ABV. It’s a dark ruby ale, with a very fleeting head that leaves the beer looking flat in short order. The nose is rich, with toffee, sweet sticky malt and just a hint of dark berries. It’s initially sweet in the mouth, a dark maltiness that tastes almost like unfermented wort. The carbonation is subtle to the point of inperceptibility and the bitterness is almost as understated. It’s actually very nice; a real ‘old ale’ feel to it, even if it fails to pack the punch suggested by the ‘strong’ in its name. Oatmeal Stout is a classic 4.3% stout; a deep dark brown coloured beer with a fine textured tan head. The aroma is perfect, with treacle and burnt sugar notes. 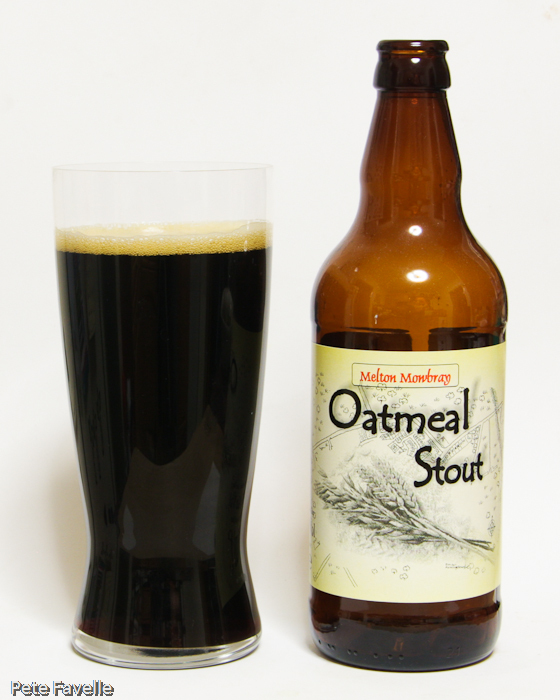 In the mouth, it has a surprisingly light body – especially for an oatmeal stout – and lacks any real sweetness. The burnt sugar notes contribute to a building bitter kick at the end and if it just had a bit more body, it would be a great stout. And that sums up Belvoir for me; the beers are all decent, traditional drinks that miss out on being remarkable by a narrow margin. There’s certainly nothing wrong with any of them, but there’s nothing tempting me to hunt them out again. These are precisely the beers that came to mind when reading Boak & Bailey’s recent posts about why so many breweries are overlooked by beer bloggers. With over a thousand breweries to try, you have to be doing something special to stand out. All of which brings us to Belvoir’s party trick – the USP they hope will set them apart from the pack. 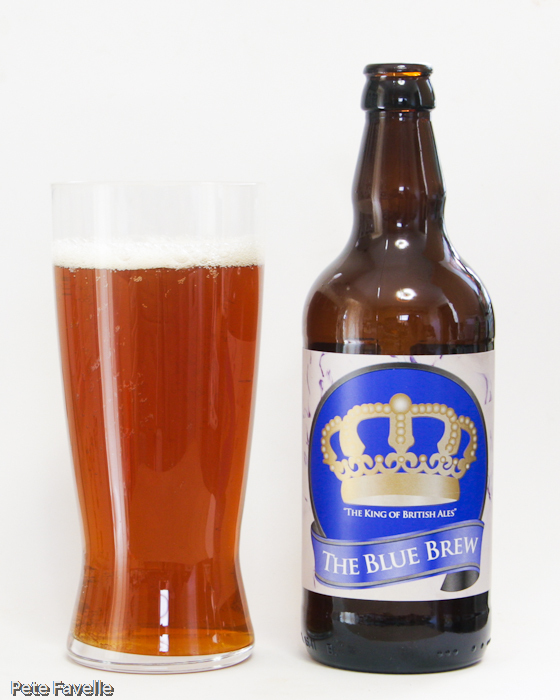 The Blue Brew is a 4.2% ABV amber beer – so far, so conventional. But the Blue in the name refers to the fact that it’s blue cheese flavoured – or rather, that whey from Stilton is added. I love beer and I love blue cheese, so this should be heaven. Sadly, in the mouth that hint of cheese disappears – light caramel sweetness and a nondescript bitterness, this time joined by a slight metallic note. Not really a beer revolution, so much as a misfiring gimmick.